Cupcakes topped and ready to eat! It’s a wonder any of these made it into the oven, the way I was gobbling up the batter! But once cooked, the first batch I made (with an extra tablespoon of yogurt and no nuts) turned out too sweet and moist for me. The kids didn’t share my opinion – they thought they were just right. For the second batch, I used the recipe exactly as it is written here, with walnuts. They’re still on the sweet and moist side, but you won’t hear me complaining! Combine eggs, bananas, coconut oil, yogurt, honey, cinnamon, nutmeg, salt, and vanilla in food processor until well-blended. Add coconut flour and blend in food processor until completely smooth. If using nuts, add the nuts and pulse the food processor until they are in small pieces. Put cupcake liners in your muffin tin, and fill each one nearly full. Bake for 15-20 minutes, or until a toothpick inserted in center of cupcake comes out clean. Let cool in pan for at least 10 minutes before removing. Cool completely. Combine all ingredients in a small saucepan and whisk together over medium heat. Drop a generous dollop of ganache over each completely cooled cupcake. Put shredded coconut in single layer on a baking sheet. Toast in oven for 5 minutes or until light brown. Sprinkle over cupcakes while ganache is still warm. This post is part of Allergy Free Wednesdays, Gluten Free Wednesdays, Simple Lives Thursday, Freaky Friday, Fresh Bites Friday, Allergy Friendly Lunchbox Love, Sunday School, Fat Tuesday. OMG! these sound to die for! I can’t wait until the weekend to give these little tasty cupcakes a try! Would love for you to share on the recipe hop this week. Others would enjoy this as well, I’m sure ? These cupcakes look so amazing!. I am new here. Are all of your recipes GAPS friendly like this one? Looks to be, but I wanted to double check. Thanks! 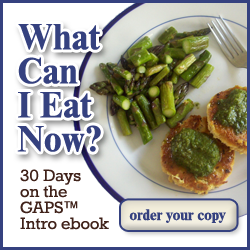 Yes, all the recipes on the site are GAPS friendly. If I include something that isn’t GAPS legal (rare!) I make a note of it right there in the recipe. Many of the recipes also have options listed to make them compatible with earlier stages. Enjoy!